Do you think your company is too young, scrappy, and hungry to allow for the luxury of “do gooder” programs? It is an unfortunately common misconception that social responsibility activities should wait until your company or product is at least generating sustainable revenue. After all, that early capital is for plain old growth, right? Maybe not. In fact, the case is quite the opposite. Though effective methods of measurement are still debated, there is some solid evidence emerging (for example, from researchers at Kellogg) that suggests companies that invest in social responsibility tend to perform better financially. This starts with your employees—especially your millennial employees. A recent study by Cone Communication found that 62% are willing to take a pay cut to work for a responsible company. Plus, positively engaged employees tend to stay longer and are more productive, leading to additional cost-savings. A similar story is true for your customers—especially your Millennial customers. This consumer generation is expected to spend $200 billion a year by 2017. Where will that spending power go? Brands and companies that take social responsibility seriously, we hope. More than 9 in 10 Millennials would switch brands to one associated with a cause. Sustainability isn’t just how you package things; it is about more effective and efficient employees, more loyal and engaged customers, and better financial performance overall. You don’t need a corporate foundation—or even dedicated resources to do this well. Cause marketing can be an effective, low-cost activity for early-stage companies, or as part of new product launches, to propel a social responsibility strategy. Here are 3 things all startups should consider in their approach to corporate social responsibility. Breather is a great example of a hot startup taking this to heart. Called the “Uber for private workspaces,” Breather lets you unlock private spaces on-the-go and on-demand where you can work, meet, and relax. The company recently closed another round of funding, and rather than employing some growth hack like discounted prices this holiday season, Breather is donating $50 through GlobalGiving for every full-day reservation through January 15th. For their cause marketing, Breather sought a partner like GlobalGiving as opposed to just a vendor. We collaborated to develop a co-branded landing page and a larger promotional strategy for social media. The end result of a partnership tends to be more impactful and effective because both parties have an opportunity to add value; in this case, the campaign benefits from promotion through both GlobalGiving’s and Breather’s networks. One of Breather’s primary causes for this campaign is homelessness. They are directing donations through GlobalGiving to a project of United Planning Organization called “Help UPO Help the DC Homeless” and a project of Latin American Youth Center called “Help 100 Youth Exit Homelessness in Washington, DC”. It makes sense given Breather is a company that provides access to safe and secure physical spaces. A strong parallel between your brand and your chosen cause is vital for the success of the campaign. In a study by BrandStar, 65% of consumers are unable to make sense of a business’s or brand’s social responsibility programs. A close coupling of brand and cause will make it easier for your audience to understand your values and therefore more willing to engage. Breather is just one example of great, early-stage companies or new product launches GlobalGiving has worked with to power low-overhead, meaningful customer engagement. For more information on Breather, email washingtonDC@breather.com. Employee engagement and culture issues are the number one human resources challenge for companies according to Deloitte’s 2015 Global Human Capital Trends study. More than 85% of respondents cite this challenge as “important,” including 50% who say it is “very important.” But for all the recent buzz around employee engagement, misconceptions around the true meaning of the term are still common. 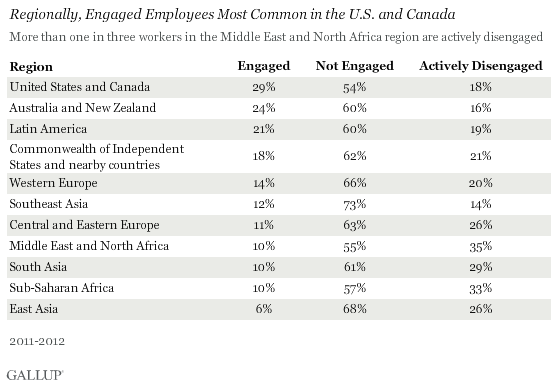 This may be part of the reason why a low 13% of employees worldwide are engaged. Gallup estimates that employees who fall into the “not engaged” and “actively disengaged” categories collectively cost $319 to $398 billion annually in the U.S. alone. And two important CSR target groups, managers and millennials, have low levels of engagement: Millennials, who are set to make up 75% of the global workforce by 2030, are the least engaged generation, and only 35% of managers are engaged in their jobs. Implementing strategies that reach the individual emotional level can be a logistical challenge, especially for global companies with diverse workforces. Luckily, with companies’ increased prioritization of employee engagement, there has been a flood of research on the topic. The O.C. Tanner Institute finds that recognition has a direct impact on causing great work, increasing engagement, encouraging innovation and productivity, improving trust and manager relationships, and attracting and retaining talent. In particular, HR leaders and practitioners reported in the 2015 SHRM/Globoforce Survey that values-based recognition programs significantly contribute to bottom-line organizational metrics – engagement, retention, safety, wellness, employer brand, and even cost controls – and help employers create a stronger culture and more human workplace. EMC, a global leader in information technology as a service, has aligned its recognition program with its overall CSR strategy. Each month, new hires and employees celebrating a service anniversary are sent a $25 GlobalGiving e-gift card that can be redeemed in support of global projects aligned with EMC’s Giving Back strategy supporting causes such as education, food, water, and disaster relief. For the past three years, the America’s Charities Snapshot Series has tracked changes in workplace-centered philanthropy and employee engagement. Snapshot 2015 – The New Corporate DNA: Where Employee Engagement and Social Impact Converge finds dramatic shifts in employee-giving models from past years. This year, almost two-thirds (60%) of corporate respondents say they offer year-round opportunities for employees to give. The BCCCC’s 2015 Community Involvement Study found that among companies that measure the connection between volunteering and employee engagement, 89% found a positive correlation between participation and high engagement scores. Company representatives also report that volunteering helps to establish positive brand within operating communities and displays organizational values in action. Tech companies are increasingly encouraging their employees to volunteer tech skills to organizations that lack proper funds and staff. For example, the Hewlett Packard Enterprise Advising program allows HPE employees to offer their professional expertise and advice to nonprofits and entrepreneurs at no cost. In the past, HPE employees have helped in a variety of key business areas, including branding and marketing, IT, business planning, managing staff, and recruiting volunteers. Through its partnership with GlobalGiving, HPE has been able to provide support to more than 200 international nonprofits. On September 25, 2015, GlobalGiving announced a new initiative, GlobalGiving for Global Goals, in support of nonprofits around the world that are contributing toward the new Sustainable Development Goals (SDGs) with their work in their communities. As world leaders have come together to commit to 17 Global Goals to end extreme poverty, fight inequality & injustice, and fix climate change during UN Week in New York, GlobalGiving is mobilizing individual donors, corporations, and philanthropists to take action around these goals. The Millennium Development Goals, the predecessors to the SDGs, shaped the international development agenda over the past three decades. Since 1990, more than 1 billion people have been lifted out of extreme poverty, cutting the rate of poverty in half worldwide. But there is still much work to be done, and this time, the new SDGs aim to foster a more inclusive effort by governments, the private sector, and civil society to finish the job. GlobalGiving is supporting thousands of vetted nonprofit organizations around the world that have long been working to address the issues laid out by the SDG agenda. The new GlobalGiving Global Goals initiative features sustainable development projects that address each of the 17 Goals. GlobalGiving has vetted each of the featured nonprofits, and they are among GlobalGiving’s highest-ranked organizations; those that are committed to learning and effectiveness. “We believe that locally-driven organizations committed to listening to their communities are in a powerful position to make lasting change in regard to poverty, climate change, and inequality. The launch of the SDGs is a great opportunity to raise the profile of those local changemakers, whose voices are vital in this conversation, and also to help individual and institutional donors identify opportunities to make meaningful contributions toward the goals,” said John Hecklinger, Chief Program Officer at GlobalGiving. It is not only individuals who are interested in new ways to make strides toward the SDGs. Private companies, grantmakers, and other philanthropic organisations are also working with GlobalGiving to channel funding toward local projects addressing the goals. The SDG Philanthropy Platform aims to build a means for philanthropy to engage with, and participate more effectively in the Post-2015 Agenda, and amplify the voice and action of grant makers and grantees in determining and achieving international targets and strategies. GlobalGiving is proud to partner with the SDG Philanthropy Platform to help philanthropists support effective development outcomes around the globe. Visit SDGfunders.org for more information. Learn how you can get involved with the GlobalGiving Global Goals at GlobalGiving.org/sdg. In the world of philanthropy, the conversation around girls and women continues to pick up steam. Recent articles by Bill Gates and the NoVo Foundation highlight the importance of empowering girls and women, and here at GlobalGiving we’ve seen a spike in corporate interest in the topic. We’ve learned a lot from running campaigns on this topic, like the highly successful CHIME FOR CHANGE campaign, founded by Gucci and partners Salma Hayek Pinault & Beyonce Knowles-Carter. Here are five things that have made this cause marketing effort stand out. When Gucci and its partners launched CHIME FOR CHANGE, there was a clear connection between the business and the campaign’s focus on education, health, and justice for girls and women. They chose to support a cause their customers and ambassadors can easily connect with and join, which increases any campaign’s chance for success. Key Takeaway: It should go without saying that the cause a company decides to champion should be relevant to its business. Marketing an unfocused idea that leaves the public wondering “Why?” can be a costly distraction that won’t do much to benefit your cause, so double and triple check that the focus is intuitive to your audience and relevant to your business. When CHIME first launched with Catapult, and subsequently partnered with GlobalGiving, Gucci and its partners were looking for locally-driven projects they could impact through the campaign. Focusing on their chosen themes of education, health, and justice for girls and women, we’re using our expertise in crowdfunding and international vetting to source local projects from around the world to be featured on the CHIME FOR CHANGE website. Through its efforts to date, the campaign has raised more than $7 million to fund more than 420 projects run by 144 nonprofit partners in 88 countries. Key Takeaway: It may seem daunting to go global and local at the same time — from reputational risk to tax law, there’s a lot to consider. Luckily, there are organizations that have expertise in navigating the international nonprofit sphere and measuring local impact. They do it so you don’t have to and so your company isn’t left behind in the race to be both global and local with giving. Key Takeaway: With so many great causes around the world worth supporting, we all wish we could just say “Please help!” and that would be enough to mobilize the world. But let’s be honest: in the fight for the global consciousness, persistent humanitarian issues don’t have it easy. Using stories can help you draw emotional connections with your audience, making your cause feel more personal and real. For tips on how to tell a great story, visit http://stillmotionblog.com/storyfirst/. Key Takeaway: “This story really hit home for me. How can I help?” If there’s one question any cause marketing manager can expect from the public, it’s this. Just take a look at the comments section of this recent New York Times piece. Readers were touched by the compelling story of a mother separated from her son and wanted to know how to take action. Don’t make your audience do the heavy lifting. You’ve already inspired them to want to help your cause, so all that’s left is to give them an easy way to do it. CHIME FOR CHANGE certainly didn’t waste time waiting for the spotlight to fall on their campaign. Team CHIME has been busy since the start using a variety of mediums to reach different target audiences. Just last week it was announced that CHIME has partnered with Global Citizen to present the September 2015 Global Citizen Festival in Central Park. As a result, a tremendous amount of attention is being paid to the issues surrounding girls and women worldwide. How do they do it? Earning the support of leading celebrity women like co-founders Salma Hayek and Beyoncé Knowles-Carter. Features on the world stage at prestigious gatherings like TEDWomen and International Women’s Day. Harnessing the power of technology to drive change by launching Twitter campaigns like #CHIMEHACK and recent #CHIMEHACK 2. Key Takeaway: Build it and they will come…right? Not so much. During a time when the public is constantly bombarded with information, commanding the attention of your audience is crucial. Take a leaf out of CHIME’s book by trying different modes of communication to reach a broader audience.